I make and talk about games. Yesterday, I talked about how monetization is best when a player wants to spend money. Before you really sell something to someone, though, you need to understand what you’re really selling. Let’s have a look at this GDC Vault presentation on D&D Online: Stormreach. Quick history lesson: D&D Online: Stormreach started as a subscription-based MMORPG. They went free-to-play, and their monthly active users multiplied by 10 and their monthly revenues multiplied by 5. On top of that, they managed to monetize 20% of their players, which is an incredible conversion rate. Now, let’s have a look at their top-selling items from September 2009 through February 2010. The biggest trend that jumps out to me is that all of these items, with the exception of the +1 Full Plate and Copper Sigils of Leveling, are consumables. Two of those items are resurrection items, two are XP boosters, and two are related to getting more treasure. The biggest lesson we can take from this is, in retrospect, obvious. The items that sell the most units are ones that players will frequently use and are consumed upon use. You can sell these items multiple times to each player, they’re often cheap, and they save the players some time. Now let’s have a look at the biggest earners. When you look at this list and compare it to the previous one, you’ll notice that this list only has two consumables: An XP booster and a resurrection item. The other eight items are comprised of three content unlocks, two power upgrades, and a convenience upgrade. There’s a lot more diversity here, but the general trend I’m noticing here is that the top revenue earners are dominated by permanent upgrades. You can charge a lot more for permanent unlocks, and they bring in a lot of revenue, but you do need to be a little cautious with them. For one, their effects are permanent. If a permanent upgrade provides paying players with an extreme advantage, you face the risk of alienating other players. This is especially risky in the case of games with a heavy player versus player element. Every time that permanent unlock is used to the detriment of another player, it’s creating a negative experience. That permanent unlock won’t just be used once. It’s going to be used dozens of times. Hundreds of times. You need to make sure that unlock makes the game a more interesting experience for everyone, even the person it’s wielded against, or the price of your revenue is going to be the lifetime of the game. The other big thing you need to watch out for with permanent unlocks is that you can only sell them so many times per player. If a player pays to unlock a new class, they can’t unlock it a second time. This is obvious, but it is something to consider. In order to sell it again, you need to convince another player to buy it. Not everything is going to appeal to everyone, so if you want to monetize through unlockable content, you need to release more of it. I want to be clear that this isn’t a warning against using permanent unlocks. Not everyone is willing to buy consumables, and adding new content in particular adds to your game’s value and feature set. Every time League of Legends adds a new champion, the game gets a little deeper and people start talking, and with 27 million daily active users, they have to be doing something right. So, to wrap things up. Monetized consumables provide a steady stream of revenue because players use them all the time and can buy them over and over again. Monetized unlocks provide bursts of revenue as long as you have players capable of buying them. Consumables provide you with a safe and stable source of revenue that you can always count on, and unlocks are literal game-changing features that can hit those high numbers. Before we stop for now, though, don’t underestimate consumables! That Major Experience Elixir is number 2 on both lists, and Candy Crush Saga is nothing but consumables. Until next time! Addendum: I should note that if I had the sales numbers, I’d be able to draw more detailed conclusions (or perhaps entirely different conclusions!). These numbers are also about four years old, but when it comes to publicly available monetization data, you take what you can get. Today, I’d like to talk about a fascinating intersection of MMORPG economies and hard currencies. More specifically, the Astral Diamond system in Neverwinter. Most hard currencies are regularly used by only a minority of players in games, but Neverwinter is designed for a constant flow of Astral Diamonds from players of all kinds, and with a player base of over two million players, that’s got to be bringing in some serious revenue. So, what is an Astral Diamond? It’s a currency that acts as an accelerant for Zen, the game’s hard currency. This’ll take a little explaining, so bear with me. It’ll all make sense in the end. Astral Diamonds can be earned through play, but there’s a hard limit on how many a player can earn in each day. On top of that, when players do earn Astral Diamonds, they earn them in a form called Rough Astral Diamonds that can’t be spent. These need to be refined into normal Astral Diamonds first, and a hard cap of 24,000 Astral Diamonds can be refined per player per day (Presumably to limit the speed at which Astral Diamonds can enter the economy and keep it from being devalued too quickly). 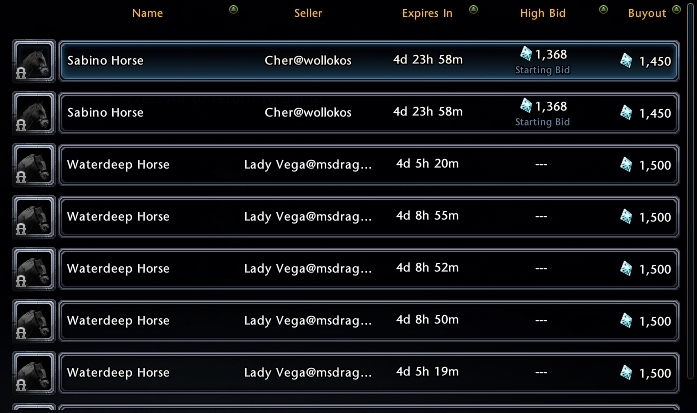 Astral Diamonds can be used to buy high-value items, but where this gets really interesting is with the auction house. 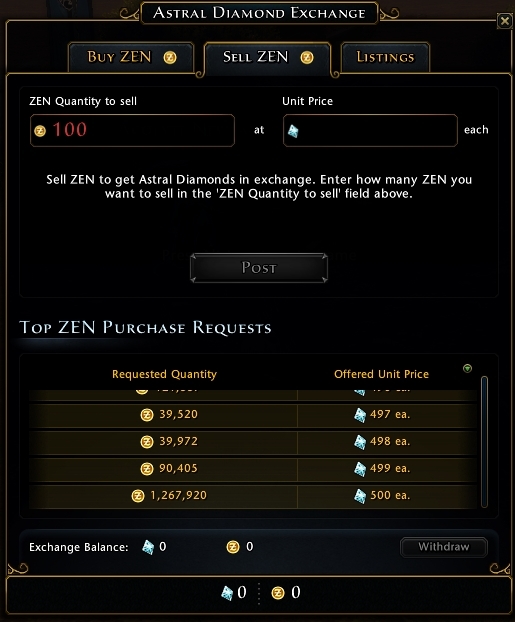 In Neverwinter, the only currency accepted by the auction house is the Astral Diamond, and thus the main currency exchanged between players. Astral Diamonds are the lifeblood of the game’s entire economy. Each player that exists can add a maximum of 24,000 Astral Diamonds to the game’s economy per day, and each transaction in the auction house removes 10% of the Diamonds from the economy. Astral Diamonds can be spent on other goods as well, but my belief is that the auction house is primarily responsible for removing Astral Diamonds from the economy. Now, let’s talk about the actual hard currency and how it relates to Astral Diamonds. The hard currency is called Zen, and it’s used by other games published by Perfect World. Players can use Zen to buy premium MMORPG goods such as character slots, boosters, high quality gear, etc. It works just like you’d expect a premium currency to work. However, there’s one final key feature to this equation: The Astral Diamond Exchange. Players who want those goods but don’t want to spend real money can instead offer their Astral Diamonds to other players in exchange for Zen. Players in need of Astral Diamonds can buy Zen and exchange it for someone else’s Astral Diamonds. Players who don’t pay money can still enjoy items that cost hard currency, but someone somewhere still contributes revenue. I’ve seen this in Puzzle Pirates and a few other games, and premium currency exchanges have always fascinated me, especially since the prices are player-controlled and fluctuate to meet supply and demand. If you combine the existence of the Astral Diamond Exchange with the presence of the Astral Diamond-only auction house, you get something magical. The auction house is full of desirable goods, and the transaction fee creates a constant drain on the number of Astral Diamonds in circulation (offset by the creation of new Astral Diamonds). Players who want to trade Astral Diamonds for Zen will become very active on the auction house, selling whatever they can and contributing to the game’s community and economy. The value of the Zen is tied closely to the Astral Diamond; if the market has many Astral Diamonds, the value of the Astral Diamond falls and the Zen can be traded for more Astral Diamonds (capped at 500 Astral Diamonds per Zen). Some might be bothered that a player can get premium currency without spending real money, but it doesn’t matter if a player can benefit from Zen without personally spending money on it. What matters is that the Zen is purchased, creating revenue, and that the Zen is spent, removing it from the economy. A top-performing free-to-play game needs to have monetization intertwined with the game design at its most fundamental levels, and by creating a careful tie between the premium currency and the economy, Cryptic has built something fascinating.